A row of four duplexes -- houses that were a single building, but owned by two separate people -- once stood on Elliot Street. Today, only a single duplex of this era remains and its future is very much uncertain. 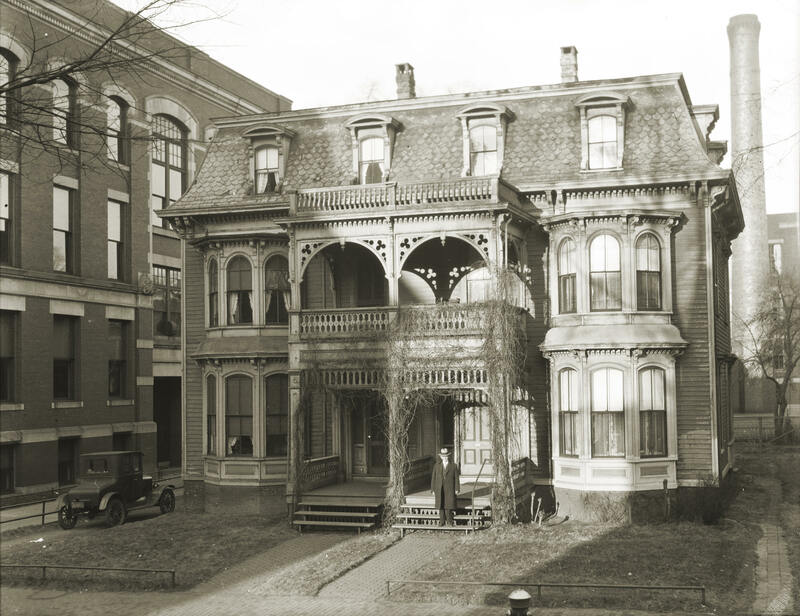 Here is a photo from the only wooden duplex of the four on Elliot St. in 1910 (all others were brick). Click the image for more detail. I believe the photo dates from around 1928, based on the license plate design on the Model T in the driveway. I actually bought it on eBay, as a film negative, and with a new scanner I was able to generate this image. You can see Technical High School directly to the left of this house, as well as the power plant and the "annex" directly behind it. I'm not sure when this house was demolished, but it actually appears a little shabby even in 1928 -- the paint is peeling, some roof tiles are broken, and some trim is missing. I guess few people were enamored with living in a house bordered by a large high school. 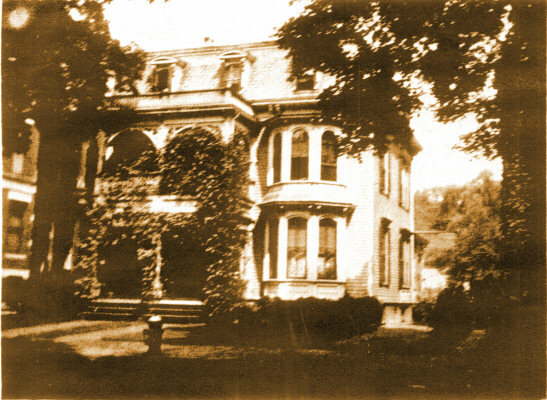 I actually have a second photo of this house, from a photocopy sent to me by Barbara Shaffer. That photo was taken a little earlier, probably in the 1905-1910 range. 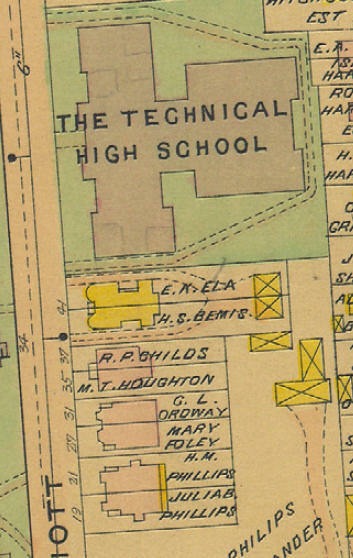 Technical High School is visible on the left, but the annex has not yet been built. 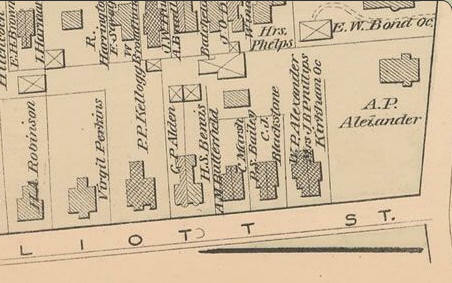 Here is a map from the 1882 city atlas showing the four duplexes right after they were built. You might note that Elliot used to be spelled "Elliott", with two t's. I'm not sure when that changed. Here is a map from the 1910 city atlas showing the area. The color-coding shows that three of the houses were brick, and one was wooden. Today, this lot serves as the parking lot for the Alexander House, one of Springfield's most historical houses, moved to its present site in the early 2000's to make way for the new Federal Courthouse on State Street. Here are some photos of the last, now fire-damaged, duplex remaining of the four, file photos from the Republican taken by Mark M. Murray. From 843 Chestnut St. to 27 Elliot St. Submitted by bookmdanno on Sat, 01/17/2009 - 22:11. I moved from 843 CHESTNUT St to 27 Elliot St around early 1979 to be closer to STCC and the library to continue my research on Napoleon Russell. The owner at that time was a real estate lady named RITA MCINNIS. She was renting rooms there at the time. Her office was on the 1st floor. ( It's the bay window on the LEFT in the front of the house.) My room was directly across from her office facing the side porch. As I recall she was an older lady that colored her hair red. She used to let me look through her MLS real estate books while I was doing my research. I lived there for about 15 months before moving to Vermont. If you go to the City of Springfield website and go to the Assessors property card there is a picture they took in DEC 2004. It's sad to think that both this house & the Chestnut St house are waiting out their fate. We NEED TO PRESERVE OUR HISTORIC STRUCTURES before they are just HISTORY!!!! Submitted by Ralph Slate Jr (not verified) on Thu, 05/12/2011 - 23:48.